Part 2 of our landscaping design series is an introduction to DIY landscape design themes. 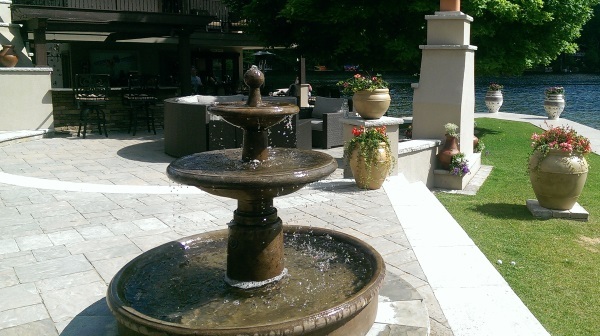 Themes are settings that we base our landscape designs around to represent our taste or needs. Themes can also be chosen for their functionality and practicality. If you happened to miss Part 1 of this series, you can click on the link at the bottom of this article. We will be adding new links to each section as then are released. Each section in the series will focus on a different aspect of landscape design covering the basics, and working our way up to landscape design principles. When we talk about landscaping themes, most of us tend to think of different regions around the globe and what you might expect to find in the yard. Themes actually encompass a little more than that. 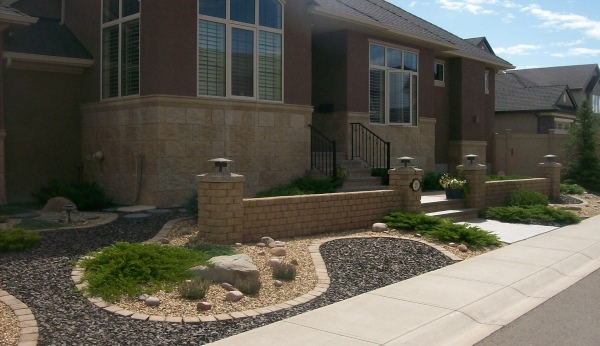 A good example of a landscaping theme outside of this thought process is Xeriscaping. What makes it different from most themes is it's based more on needs than taste. Landscaping themes can further be broken down into 3 main areas, or categories. Xeriscaping is a type of landscaping theme that focuses on low water consumption. The first one is a particular type of landscaping that usually has some purpose other than just appearance. This is where xeriscaping fits in having the purpose of water conservation. Feng Shui would also be a type of theme having the purpose of improving energy flow. The second area of themes is based around different landscaping forms. Like the word “form”, this is also where we differentiate between formal and informal design. Geometric form is more associated with squares, rectangles, shaped hedges and straighter lines. Naturalistic form would be more associated with mimicking the look and lines as things would appear in their natural habitat. Naturalistic form is complimented best when using plants, trees, grass, etc.. that are native to your region or climate, as opposed to importing non-­native plants and features. This is considered “Natural” landscaping. A naturalistic blended theme with garden beds in front of native trees and shrubs left at the time of clearing the lot. This property is less than 3 years old. Flowing curves and circles can appear in both formal, and informal designs. They can compliment, or be used as an effective transition between features in both formal and informal designs. The third and most familiar type of diy landscape design themes for most people are landscaping styles. Landscaping styles can be historical, traditional, cultural, or modern. Some good examples would be traditional Italian, Japanese, Mediterranean and now even urban. Think about a homeowner in the desert installing irrigation to have a lush green lawn and non-­native plants. Their theme would be shifting towards an “Urban” North American theme. If they still had some cacti and local plants, than it would be considered a “Mixed” theme. Mixed themes are where things get tricky. Most of us view landscaping themes as something that reflects a particular style we would see in different areas of the world. Themes can be mixed or blended, although this takes some skill to design without confusing the eye. There could be partial themes, or no particular theme at all. Successfully designed yards that have more that one theme usually have some sort of separation between them. A front yard can have a different theme than the back yard because they can't be viewed at the same time. Being able to view 2 completely different themes at the same time can sometimes be a problem. We talked before about driving around and looking at other houses for inspiration and ideas. Understanding themes is on more thing to help you develop an eye for landscaping. That is the purpose of this series. 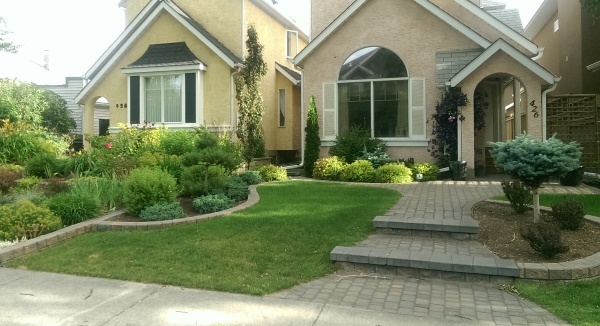 We want you to be more aware of the differences between good and bad landscape design. Landscaping between houses is the best example you will find of landscaping themes that visually fight each other because they lack a barrier or separation. Do these 2 designs work? The small garden bed along the brick wall installed on the house on the right actually breaks up the straight dividing wall and blends the two front yards giving each design a little more unity. The house on the right is more of an urban design and the house on the left is more of a naturalistic design. We hope you enjoyed this introduction to diy landscape themes. We'll get into some more about landscape designing in the next article. Here's a recap of things to remember when considering a theme. Understand that themes can have a specific purpose (Type), like Xeriscaping. They can be focused around the use of form, but most notably represent a particular style. Consider if and what role theme will play in your design. Determine if your design will be more formal or informal. Be careful not to confuse the eye with mixing themes. 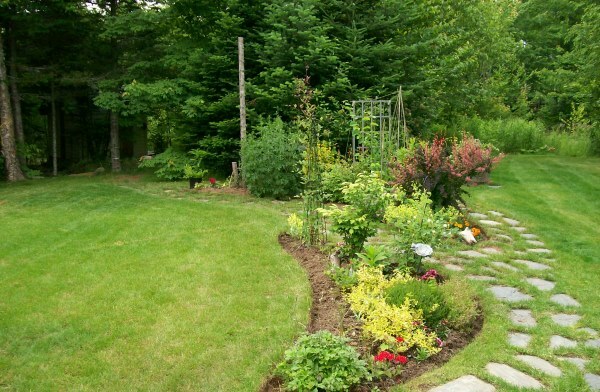 Have a visual separation between sections of your yard that have different themes.